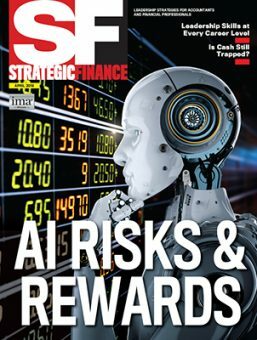 As more manufacturers move to Toyota-style Lean management, some CFOs are asking a controversial question: Is it time to move away from standard costing and variance analysis (SCVA)? Proper Lean management makes SCVA obsolete. 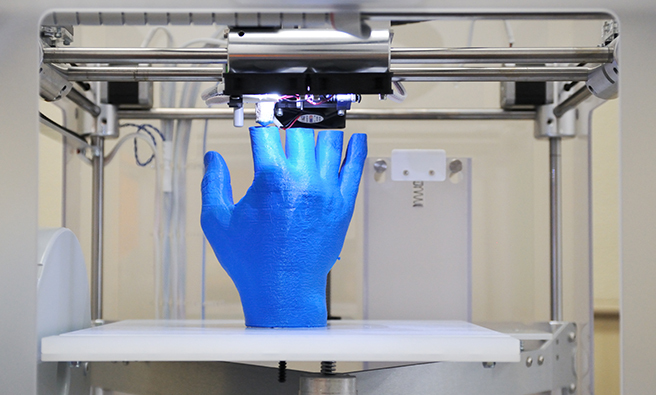 A holdover from traditional production control systems, SCVA can become another form of waste. 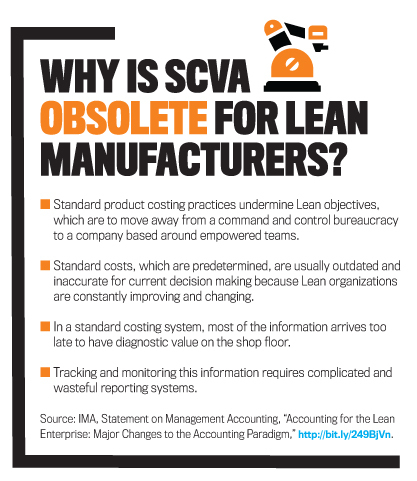 In its Statement on Management Accounting, “Accounting for the Lean Enterprise,” IMA® (Institute of Management Accountants) suggests that SCVA really isn’t a good operational control tool for Lean manufacturers (see “Why Is SCVA Obsolete for Lean Manufacturers?”). Indeed, some companies have quickly discarded SCVA in their journey toward Lean management. In the book Lean Turnaround, former CEO Art Byrne revealed that his team at the Wiremold Company successfully adopted Lean manufacturing methods in the early 1990s and eliminated SCVA within a few months! But despite success stories like Wiremold’s, field reports and other data show that even mature Lean manufacturers still use SCVA. Why are they stuck in the past, and how can we change that? When Toyota’s commitment to team-based, continuous process improvement (CPI) and respect for people produced extraordinary operating efficiencies and long-term customer loyalty, other companies took notice. Manufacturers discovered that Toyota-style Lean management principles could boost their key performance indicators (KPIs) significantly. 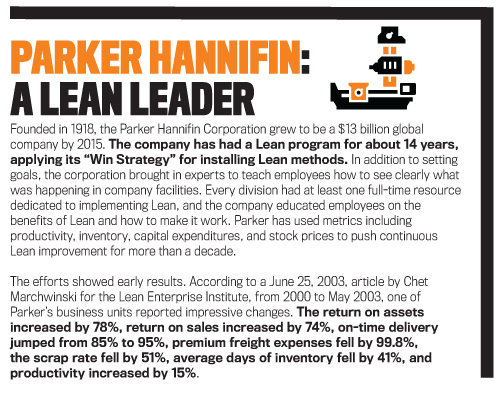 For example, after equipment manufacturer Parker Hannifin Corporation implemented Lean, one of its business unit’s on-time delivery rate went from 85% to 95%, return on sales increased 74%, and return on assets increased 78% (see “Parker Hannifin: A Lean Leader”). Successful application of Lean must begin with an unwavering commitment to creating more value for customers, streamlining business processes, eliminating all types of waste, and building long-term competitive advantages through training and employee development. Lean Accounting teams create new types of profitability reports around value streams—the series of activities that take products or services from their beginnings through to the customer. That’s a big change from producing classic income statements for each product family. To use the value stream concept, a company must change its organizational chart, assigning as many employees as possible to work exclusively for one value stream product family. Each stream begins with product development and continues through marketing, operations, shipping, and customer service—with many employees dedicated to a stream. In this way, a greater portion of formerly shared costs is assigned directly to profitability reports for each value stream. 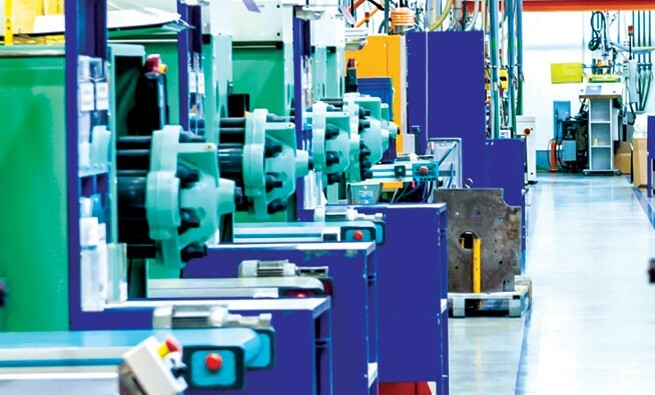 Manufacturing companies that adopt Lean methods need to continually control production operations to make efficient use of materials, labor, and overhead. Historically, production controls have come from standard costing systems. Let’s take a quick look at how those systems developed and how Lean companies can replace them. In the 1920s, the Ford Motor Company was the first mass producer to champion and use Frederick Taylor’s ideas of scientific management. SCVA was hailed as a new innovation in production control. Since then, business schools worldwide have taught it as the preferred system to control production efficiencies and costs. 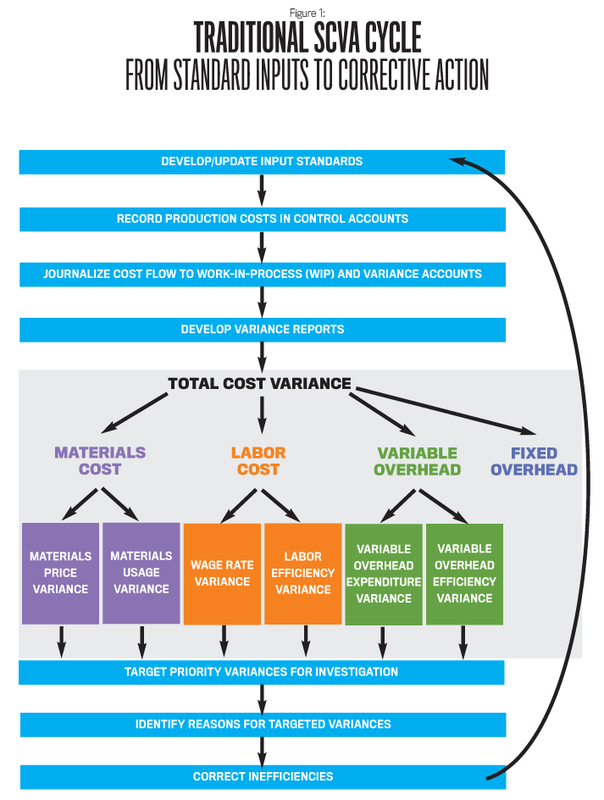 Figure 1 shows the structure of standard costing systems. They require that companies establish budgeted amounts of output and calculate standard quantities of inputs and costs for materials, labor, and manufacturing overhead (usually based on time-and-motion studies). Two important components are actual costs and standard costs. Actual costs are the amounts paid or incurred. Standard costs are an estimated or predetermined cost of performing an operation or producing a good or service under normal conditions. As the production activities begin, the actual costs of materials, labor, and overhead (indirect manufacturing costs such as maintenance, insurance, and some electricity) are collected in three control accounts, one for each actual cost input category. Then, accountants split and transfer the actual costs from each control account to either the work in process (WIP) inventory account or variance accounts. The WIP inventory account gets the standard costs for the actual units produced. The variance accounts show the difference between the actual costs and the standard costs for the units produced. Those differences or variances can be favorable or unfavorable. 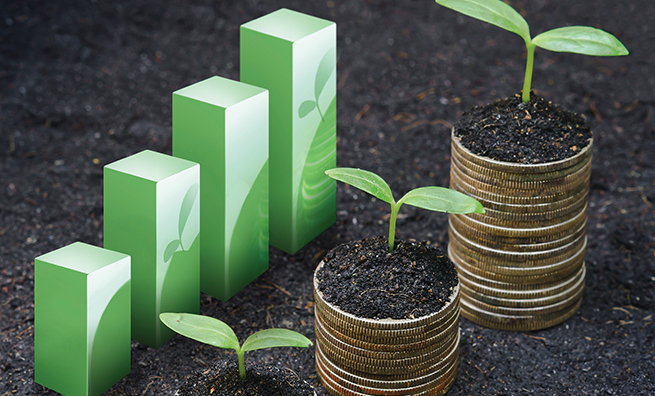 Unfavorable cost variances enable an accountant to initiate a conversation with production personnel about the root causes. overhead spending variance and overhead volume variance. If there are significantly large unfavorable cost variances, then a cost accountant goes to the shop floor to question employees about possible reasons for the higher than expected costs incurred. The system worked, and no one questioned the usefulness of SCVA until Lean management arrived. But now, pioneering Lean companies are finding that there are limitations to SCVA’s effectiveness as a production control system. The frequency of standard updates, the timeliness of data, and the granularity (the level of useful detail) of measurement all create limitations. SCVA has at least three key flaws for Lean manufacturers: inconsistent updates of standards, time-lagged data, and the need for more specific, detailed feedback data (see Table 1). Inconsistent updates of standards. Companies establish standards at the beginning of the year, often as enterprise resource planning (ERP) data inputs. But many later forget to make periodic updates as commodity markets move during the year. Labor rates may also change as industry and economic factors change. Therefore, variances may contain a significant degree of error—not because of inefficiencies but because the company updated the standards inconsistently. Time-lagged data. Variance reports frequently are developed and investigated weeks after the data is generated, creating a time lag. Cost accountants investigating the root causes of unfavorable variances often find that production people don’t remember clearly the events that generated the data, hampering any investigation. From the perspective of production teams, the SCVA reports come too late. 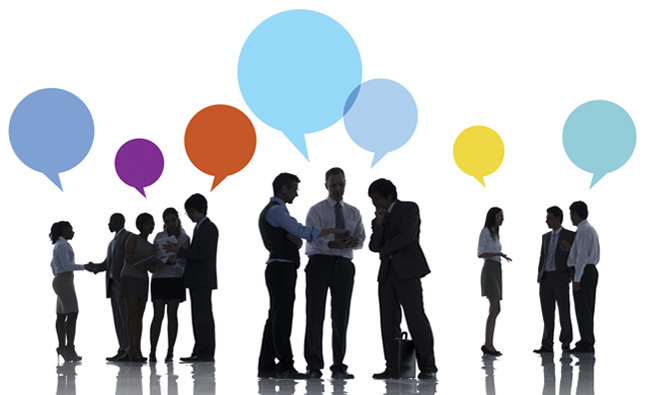 Instead, more real-time feedback is needed to correct inefficiencies quickly. Need for more granular feedback. The classic model of standard costing spans an entire production process—from the point that the company first introduces materials and labor until workers complete the finished product. But standard costing doesn’t provide data showing how much value is added by each work cell (that is, each small group of workers who perform a set of coordinated activities). Instead, traditional SCVA aggregates the data, and mathematical averaging actually hides the kind of specific, detailed information that production work-cell teams need to optimize production efficiencies. Therefore, Lean production teams using SCVA lack the work-cell-level data that tells them how well they are creating value for customers. 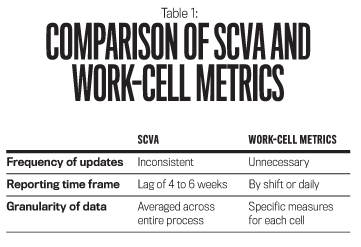 So it’s clear that SCVA doesn’t deliver work-cell-level data promptly enough to aid Lean decision making. 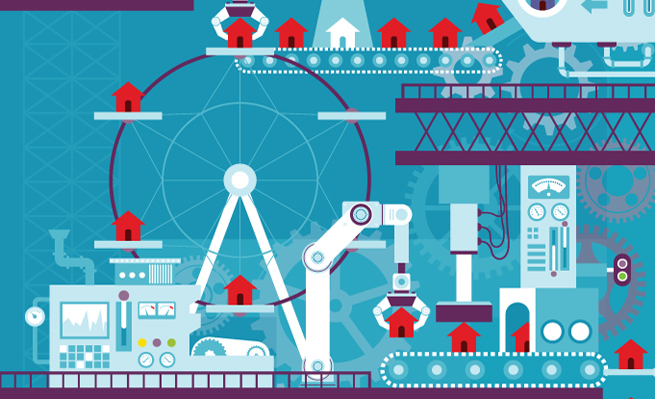 Lean manufacturers need an upgraded accounting system that better reflects performance. The solution is to use value stream costing (VSC) and work-cell metrics, which offer a better way to control production efficiencies. VSC can provide a comprehensive perspective of operational and financial progress that facilitates Lean practices throughout a company. But in addition to VSC, Lean companies also need new performance metrics that motivate and monitor Lean actions and continuous improvements. That will give management accountants the proper tools to evaluate business performance from a Lean viewpoint. Restructuring a company’s organizational chart is another important step in Lean transformation. Ideally, each employee should be assigned to only one value stream. Formerly specialized support staff (for example, those in marketing, human resources, and customer service) should now be trained as generalists and report to value line managers. Lines of reporting should move away from shared services and toward dedicated value steam assignments. Pioneers in Lean manufacturing use work-cell metrics to ensure better production control and the successful transition to VSC. Small groups that perform a set of related activities develop work-cell metrics for their work cells that give real-time feedback to optimize the effectiveness of production activities. For example, if the quality of raw material is inferior in some way, it may lead to below-normal productivity on a shift. In this case, a work-cell metric that measures the units produced per shift would be lower than expected and quickly flag a problem. Table 2 shows examples of generic work-cell metrics for the various dimensions that are important for optimizing value stream performance. Each of these metrics usually would be developed collaboratively among work-cell members, who would use the value stream metrics to help guide and determine what their priorities should be as they develop the work-cell metrics. Think of performance metrics as having three levels. The highest level, KPIs, is developed by top management. These metrics signal the priorities for improvement to management. Let’s say a company has three product families that have been organized as value streams. At the second level, management assigned to each value stream will consider how they will contribute to improving the KPIs to create the value stream metrics. At the third level, these value stream metrics determine employees’ priorities when they develop work-cell metrics. 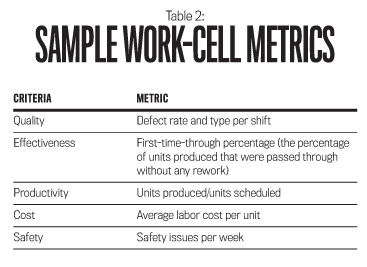 For instance, in Table 2, the productivity work-cell metric example is a ratio of units produced to units scheduled. If we follow this metric upward to the first level of KPIs, we might find it supports a KPI that tracks the percentage of orders shipped on time. At Lean companies, performance data is tracked and displayed on charts and tables posted in the work area. Cell members promptly investigate any deviations from expected values, usually correcting discovered problems within a few hours. Heavy equipment manufacturer Vermeer Corporation in Pella, Iowa, has followed Lean principles for nearly two decades. Vermeer’s work cells are organized around a sequence of production activities, such as metal cutting, bending, welding, painting, and assembly. Following good Lean practices, the work cells create display areas for charts and graphs of key metrics needed to control efficiencies. 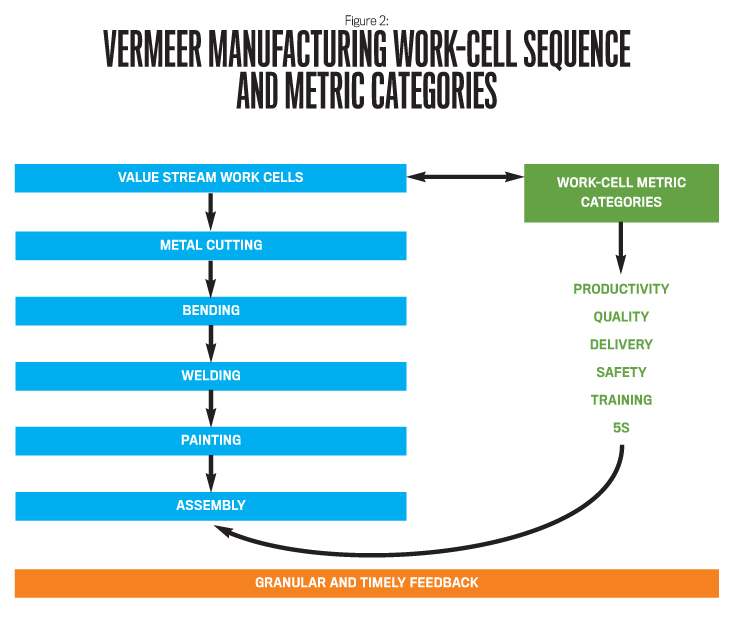 Figure 2 shows the six themes Vermeer uses for modeling work-cell metrics: productivity, quality, delivery, safety, training, and 5S (which represents the five elements for organizing the work area for efficiency and effectiveness: sort, set in order, shine, standardize, and sustain). Each metric is derived from higher-level value stream metrics, which in turn are derived from KPIs for the plant or company. Each work cell has a large visual board where cell members track the progress of metrics by hour or shift. When the data falls outside the normal control limits established for a work-cell metric, it immediately becomes a red flag for the monitor of the day to investigate and correct. Work cells quickly investigate the problem and implement problem-solving changes. In addition, Vermeer motivates people in work cells to locate and eliminate waste and improve efficiency. The end results are work-cell metrics that offer more finely detailed, timely data for production controls and for enhancing Lean operations. By following Lean methods, Vermeer reduced production cycle time on its wood chipper equipment value stream from 52 days to three days. 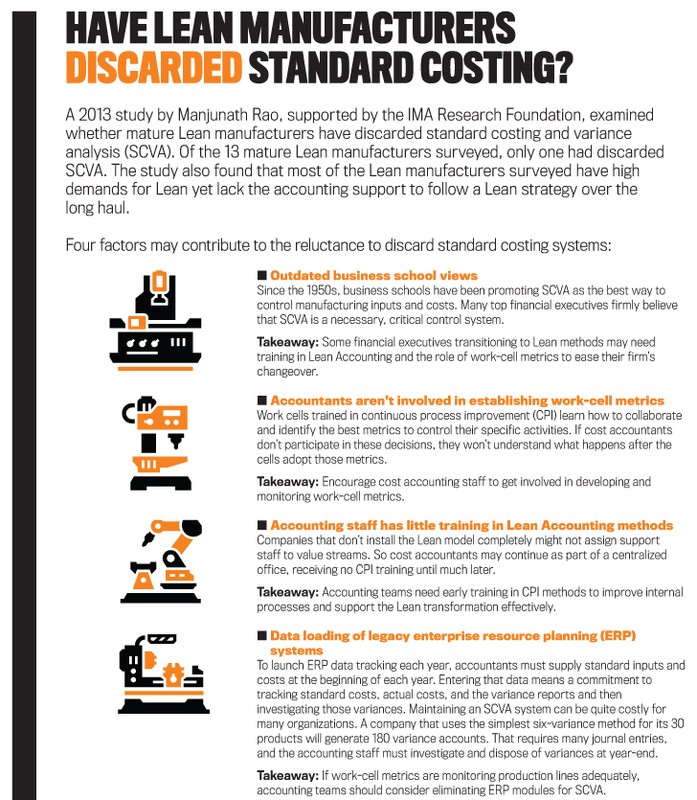 Only a small number of manufacturing firms have adopted Lean management as a guiding model and strategy (see “Have Lean Manufacturers Discarded Standard Costing?”). How can we help them move forward? One way is for management accounting teams to use the insights in this article to become partners in Lean transformation, staying alert to possible obstacles. For example, we should question if legacy accounting fixtures, such as SCVA, are necessary for production control. A closer dialogue with work-cell teams and CPI coordinators can reveal that work-cell metrics provide better information than SCVA. We also should encourage accounting professors to take a more proactive approach, teaching students how Lean companies use different methods and handle accounting reports differently. 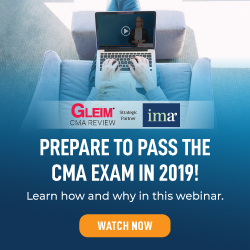 That means making a commitment to teach Lean Accounting as part of the curriculum and exposing accounting students to Lean manufacturing operations, where work-cell metrics are clearly displayed and communicated in the workplace. Instructors should let students talk with CPI coordinators about how they view SCVA reports. Today’s management accountants are standing at the threshold of a big Lean management transformation, and we need to recognize that SCVA may no longer provide the value it once did. Andrew Bargerstock, CPA, Ph.D., is chair of the department of accounting and director of MBA programs at Maharishi University of Management in Fairfield, Iowa, and a member of IMA’s Cedar Rapids Chapter. You can contact him at (641) 919-4303 or andyb@mum.edu. Ye Shi is an assistant professor of accounting at Maharishi University of Management in Fairfield, Iowa. You can contact her at (641) 980-8006 or shi@mum.edu. I read your article “Moving away from Standard Costs, Lean Companies need cost of value streams and new performance costs”. It provides a lot of light to implement in the cost accounting of any industrial production company, be it small, medium or large. However, a question arises. Can this system be implemented in a Freight Transport Company? If so, can you guide me on how to start? Very clear article. Easy to follow. A timely article. I have taught, written and delivered standard cost seminars, I developed a standard cost system practice set for a course at the University of North alabama. This article points us to the new direction.